Although you may not believe it, a single colour garden creates just as bold a statement as a multicoloured, carefully coordinated planting scheme. Although it’s a brave move, it can create a stunning landscape to look out on. And, if like us, you are addicted to plant-buying, it does at least make choosing your next purchase that bit easier! There’s a one-colour scheme garden to suit everyone’s style. Just take a look at these colours and see which one will suit your needs. You may think that an all green garden will be a little boring, but it is actually anything but! There are so many variations of green, from bright evergreen shades through to grey-green grasses. There’s also the added bonus that if you opt for plenty of evergreens within your all-green garden scheme, your garden will be relatively low maintenance. 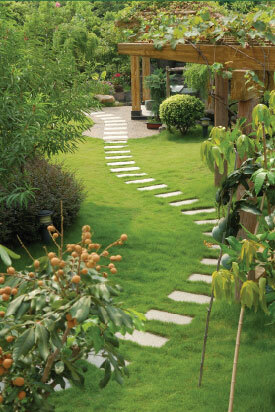 Add interest in a green garden by incorporating plenty of different textures. For example, spikey grasses alongside broad leafed plants. It’s always wise to ask a professional garden landscape company to re-landscape your outdoor space, as they will be able to produce a planting plan which will add plenty of interest to your all-green space. Of course, green is also the ‘cheat’ colour of any shade of single colour garden; by this we mean that even if you opt for a different toned garden, you will always need to include some green in the form of foliage and the leaves on your chosen coloured plants! Therefore a completely green garden is the only true one-coloured garden, however, that’s not to say that you can’t work predominantly with another colour as well. White and green foliage is a classic combination. If you have a particularly shady garden, white can really brighten it. Blend foliage in using plants with variegated leaves. The likes of white peonies and lilies will add plenty of fragrance to your garden, too. Then choose light coloured paving and stepping stones, and white picket fencing to complement the pale tones. Purple is a really regal colour and a garden with plenty of purple and lilac tones will give a cottage garden feel fit for a king. Too much deep purple is enough to make anyone melancholy, however, so choose lilacs and mid-purple hues too. Add interest through quirky plant choices such as cabbages and attract butterflies and bees through brilliant purple buddleia. Of course, lavender is an excellent choice for fragrance, and can cover large swathes of borders with ease. Red is the colour of love and passion, so why not ignite the love with your garden? Plants with red blooms but more unique foliage and textures include geraniums, salvia and petunias. Of course, red roses are the true flower of romance and can give your garden a romantic English country garden feel. We’d advise breaking up the red with plenty of lawn space, or if hard landscaping is more your thing, neutral grey pavers. Too many red or orange shades can become overpowering and angry, which isn’t what we want from your calm, peaceful outdoor space! No matter what your favourite garden colour is, D&G Garden World can help you to bring your outdoor space to life with a single colour scheme. Get in contact today for professional garden landscaping in Upminster, Brentwood or Hornchurch.